In this particular dream, I was watching the moon set over an artic landscape. 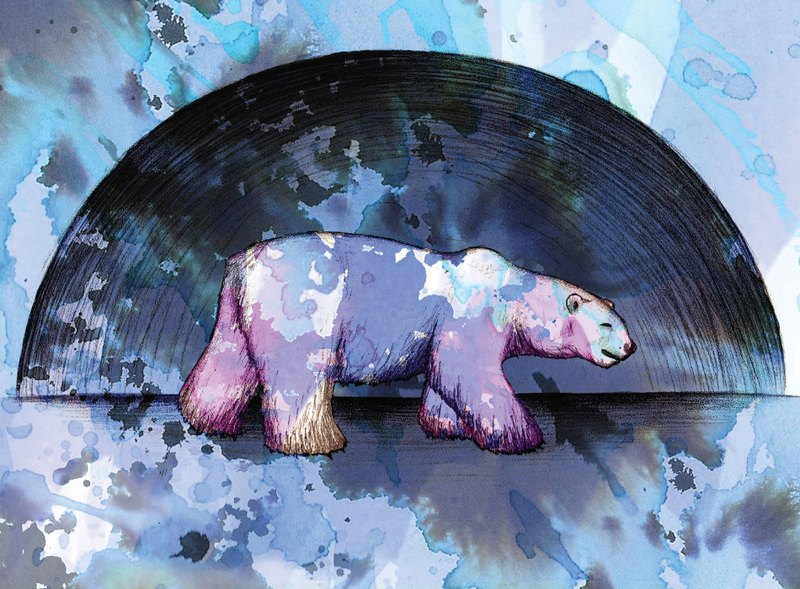 As the moon crossed the horizon, it suddenly became a polar bear. 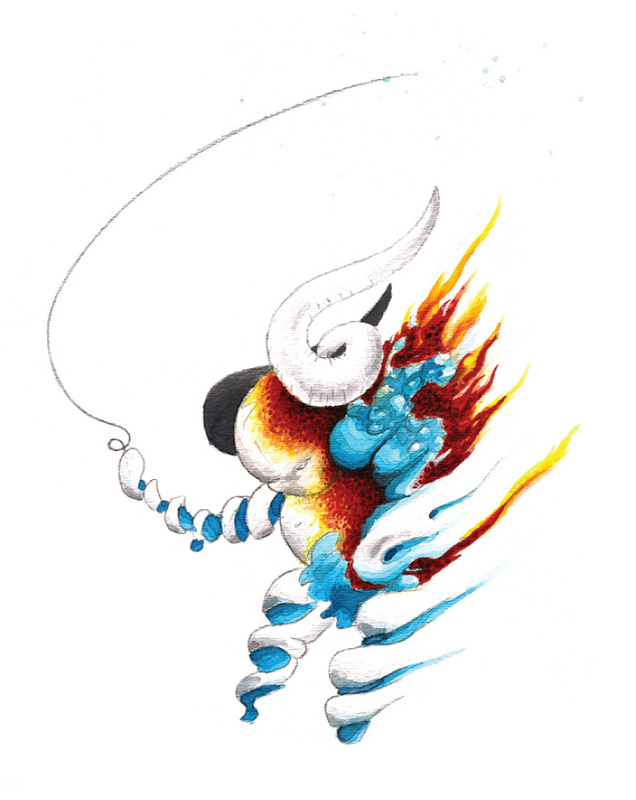 Dream Drawings: In 2007 I began keeping a record of my dreams by creating sketches of significant imagery I remembered. At first I remembered very little but as time went on, I began to remember my dreams very vividly. 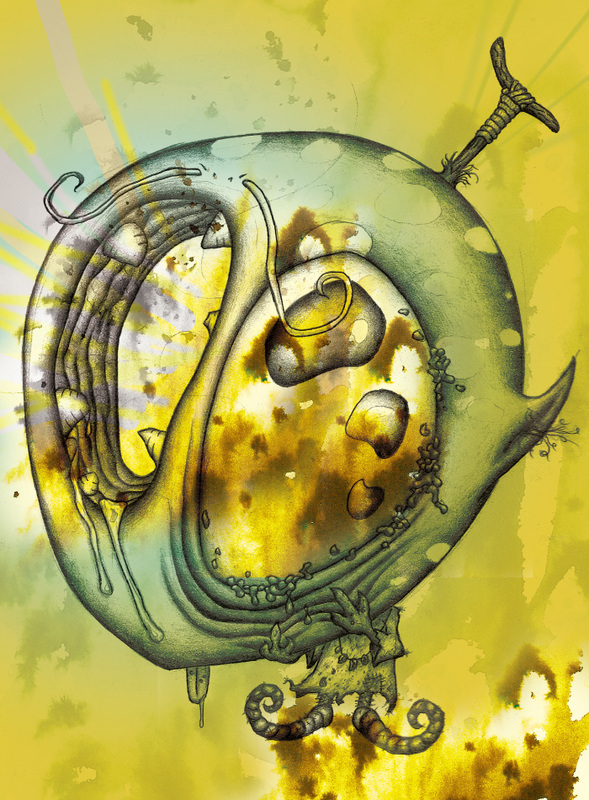 I started experiementing with tea/ink staining and eventually merged the sketches and the stained paper layers in Adobe Photoshop while manipulating and adjusting the colors to create a surrealist dream scape. In this particular dream, my family and I lived in a huge mansion. An unknown military group was attacking the mansion and so I took my family's photo album and buried it in the garden. Eventually a staircase was built over the place where I buried the photo album as if it was some kind of shrine. The girl is a descendant of mine who is aware of some kind of mystery involving the shrine. In this particular dream, I had fled a cabin which was being terrorized by some unseen beast. Another person who I thought had also been in the cabin joined me on the journey across a strange and desolate landscape. I became suspicious of my companion when he indicated to me that he knew his way around the area. When we approached a small shack, which I believed to be my compansion's home, I confronted him and accused him of being the beast which I was fleeing from. I suggested that the bones scattered around the feild were the remains of others he had lead there and asked him how long he had lived there. After reading the book: The Secret Life of Salvador Dali, I drew this self-portrait imagining Dali had infested my own mind with his madness and strange world-view. Self-portraits: In 2007 I began drawing self-portraits which looked nothing like me. The idea was to render an image which represented my current state of mind rather than my appearance. It was also a kind of automatic drawing exercise in which i would begin with drawing the eye and let the rest of the image manifest itself building outwards. 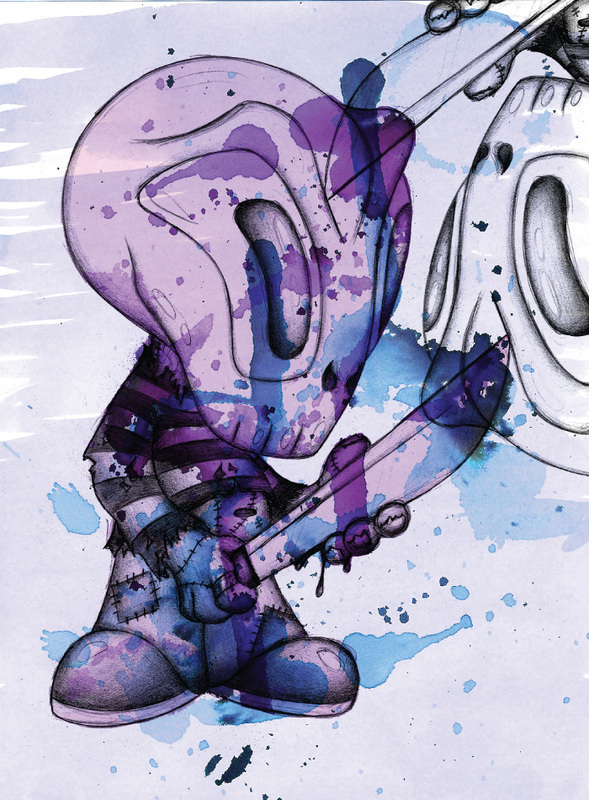 This series was developed alongside the Dream Drawing series and uses the same tea/ink stain method. In this self-portrait I reference my love for horror films by blending together various characters I have liked over the years including: Jason Vorhees, Freddy Kruger and Frankenstein's Monster. In the drawing I imagine myself as a child version of these monsters. In this self-portrait, I imagine the future of humanity after becoming mostly machine. I am questioning the point in which we stop being human and start becoming a new species which is neither human or robot. In this self-portrait, I imagine myself charged with the responsibility of uniting the people of the world but somewhat disillusioned about that task. 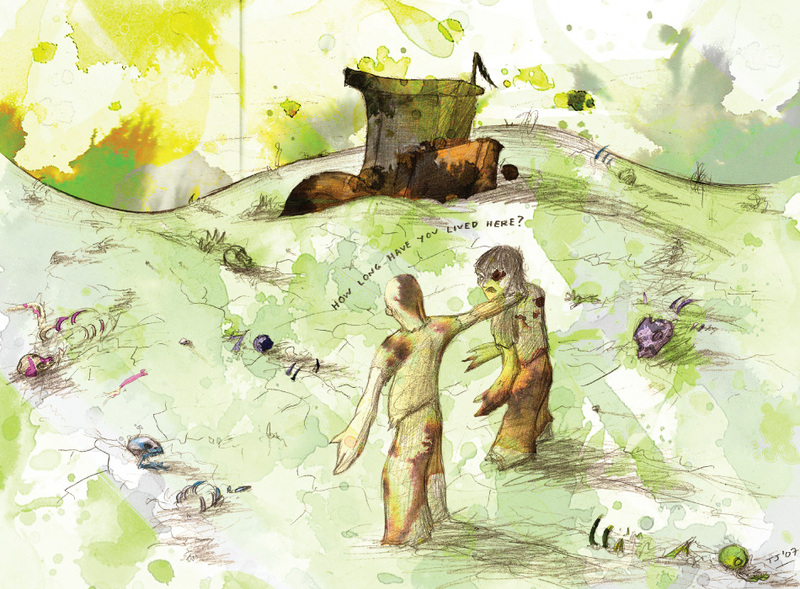 In this dream, my wife and I were enjoying a pleasant picnic on top of a grassy hill. Out of absolutely no where a Rhino came charging at us over the horizon. I reacted intinctually leading the Rhino away from ym wife and as it came to me I stepped aside and decapitated it with a samurai sword which appeared in my hands. 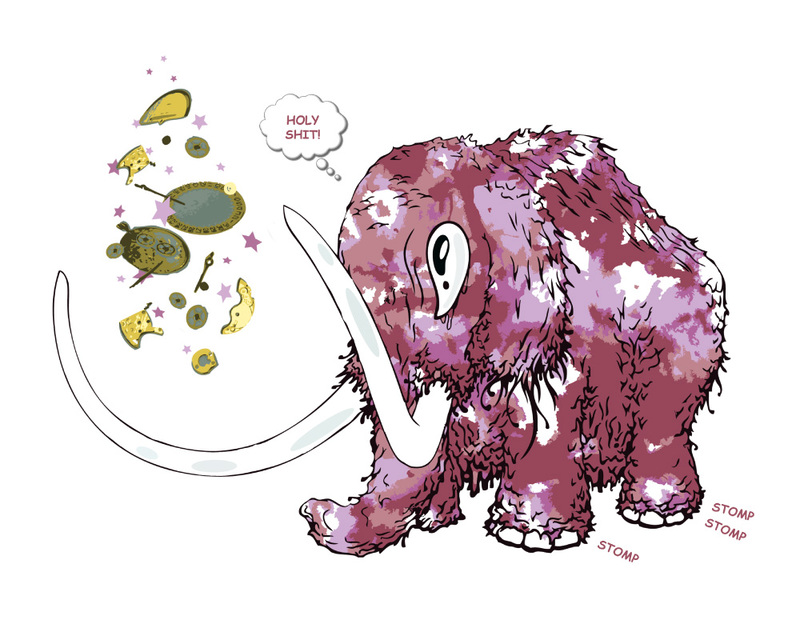 In this self-portrait, I imagine myself as a mammoth which transcends time through its own curiosity disecting a time-piece with its own will but has trouble putting the pieces back together. 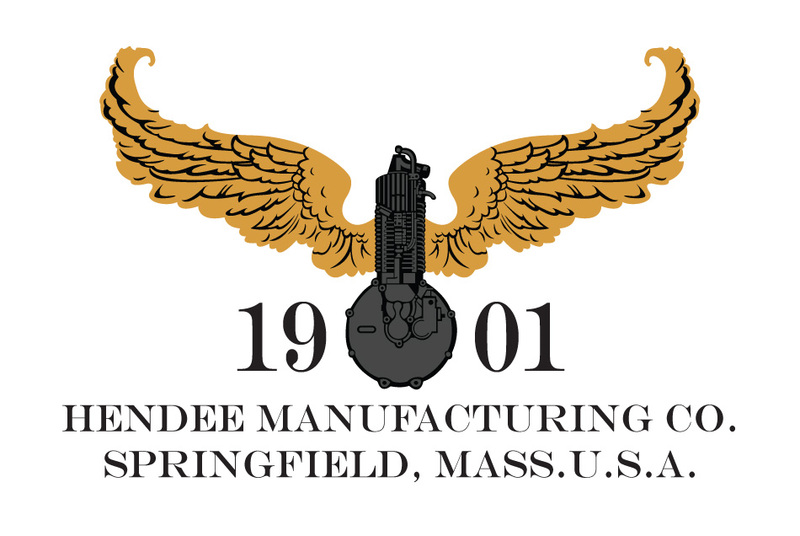 For this banner, I recreated an old Indian Motorcycle graphic (originally Hendee Manufacturing Co.). 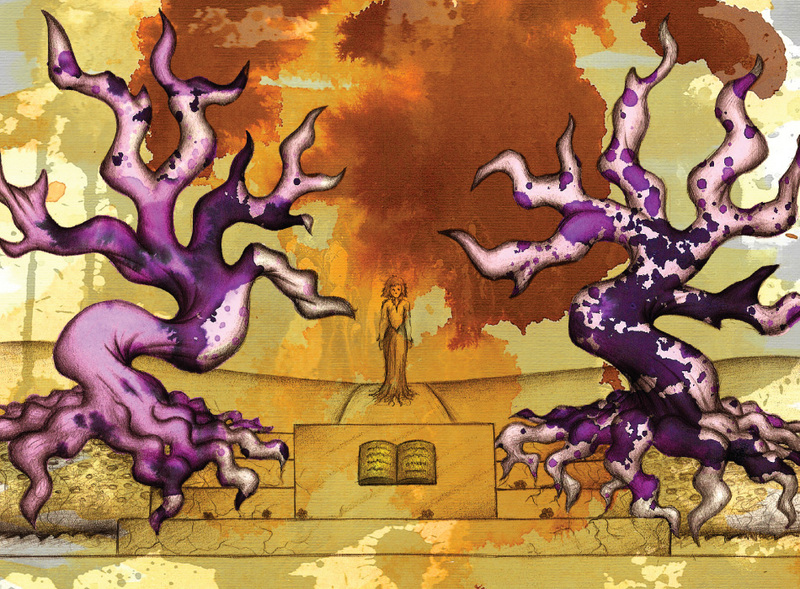 This illustration was the center piece for the exhibit and is approximately 6 x 4ft. Indian Motorcycle Exhibit: I was given the task of designing the backdrop for the Indian Motorcycle exhibit at the San Diego Automotive Museum. After a series of concepts the staff chose three designs to be made into large vector graphics and printed on banners. For this banner, I found a very old diagram of one of the original motorized bicycles by Indian. 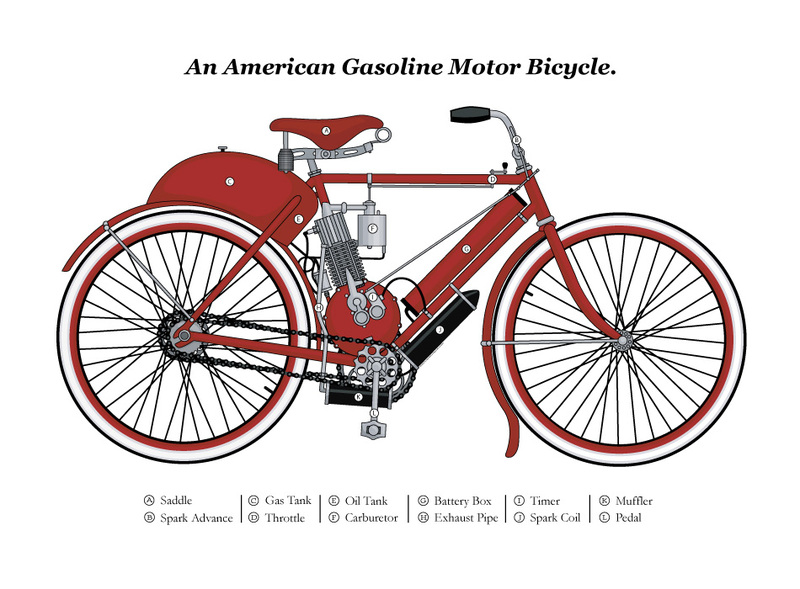 I thought recreating the diagram as a vector illustration would show the detail clearer and reveal the basics behind the design of the motor bicycle. This banner is approximately 7 x 4ft. 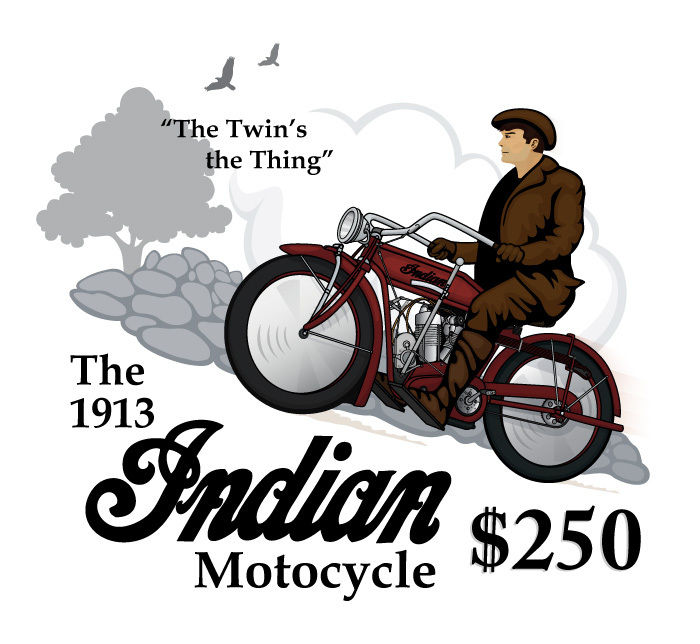 For this banner, I recreated an old Indian motorcycle advert from a newspaper of the time. Because the advert was very small and didn't have much detail, I also used photographs of the real motorcycle to pack in as much detail as possible. This banner was approximately 6ft squared. Indian Mororcycle Exhbit: I was given the task of designing the backdrop for the Indian motorcycle exhibit at the San Diego Automotive Museum. After a series of concepts the staff chose three designs to be made into large vector graphics and printed on banners. One of my favorite cars from the Auto Museum, this one of a kind plane/car is more of a motorcycle than anything else. 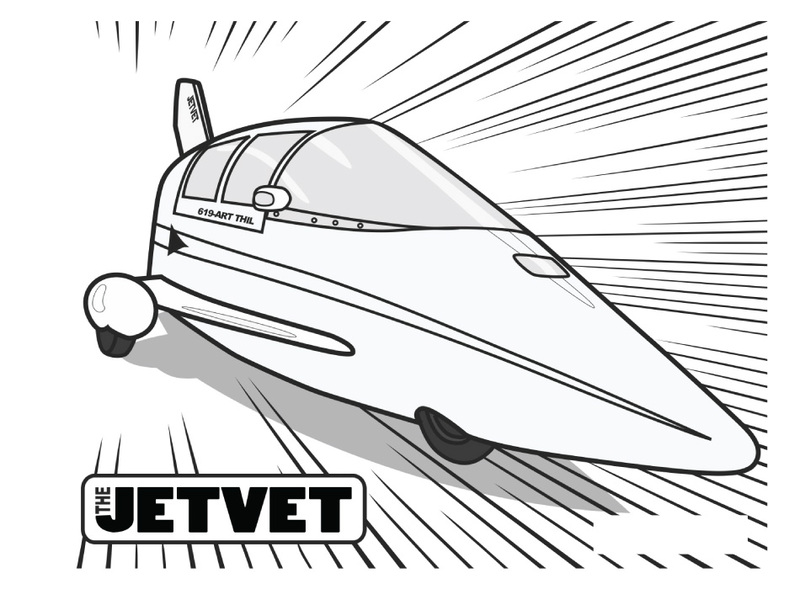 I used a dynamic manga effect to give the car a speedy look and some light rendering on the glass and wheels. SDAM Coloring Book: To showcase some of the feature cars at the Auto Museum which were not always on display and to encourage and engage children that visit the Museum, I was given the task of creating illustrations for a coloring book. 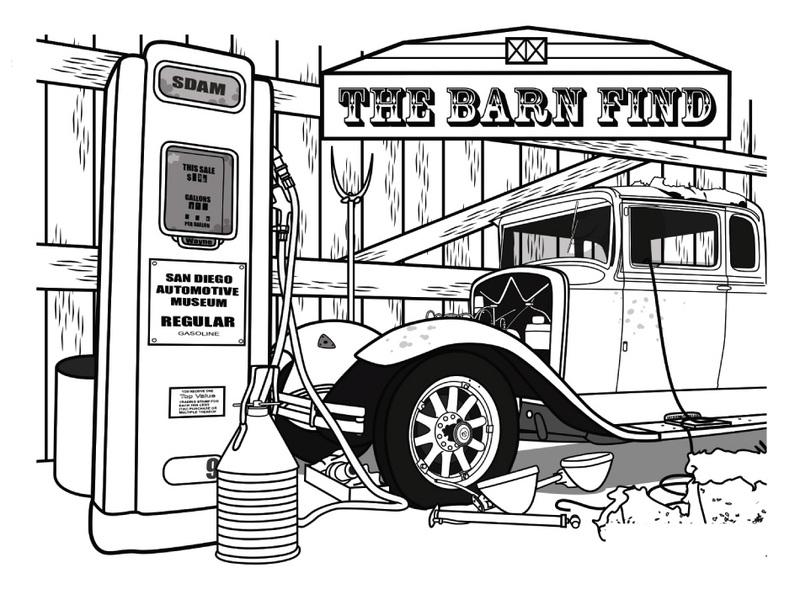 One of the permanent exhbits, the Barn Find had many pieces scattered around it which I thought would make a great graphic for the coloring book. I did some light rendering on the gas tank window and wheels as well as some rust spots on the car itself. It was great to see how the children colored this illustration. 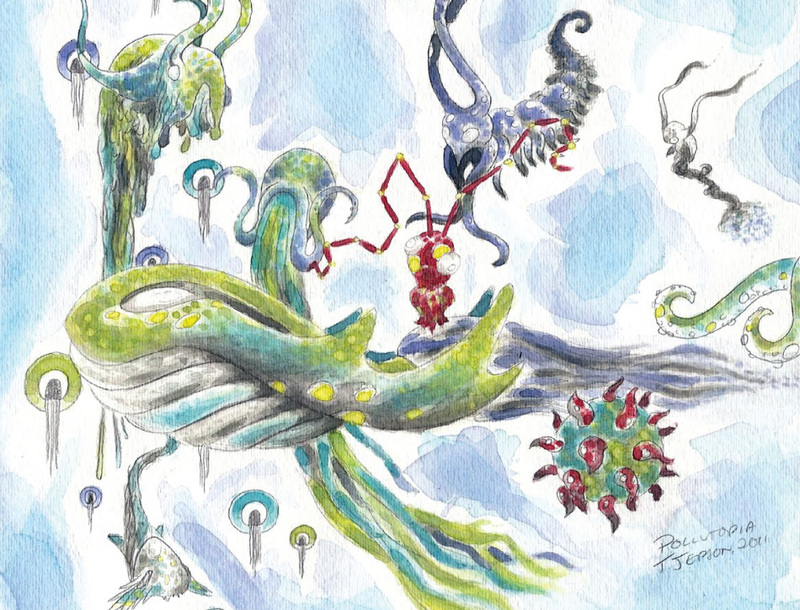 This watercolor features several characters from Pollutopia including the reoccurring character Bacchus (in the top right). Pollutopia: Loosley based on the 'Trash Vortex' in the Pacific Ocean (a gathering of plastic from the world's oceans which is bigger than the State of Texas) Pollutopia is a long term art project crossing several mediums from painting/watercolor to sculpture and digital art. Essentially I have created a new world of little monsters and various sea creatures which reflect society and modern life. 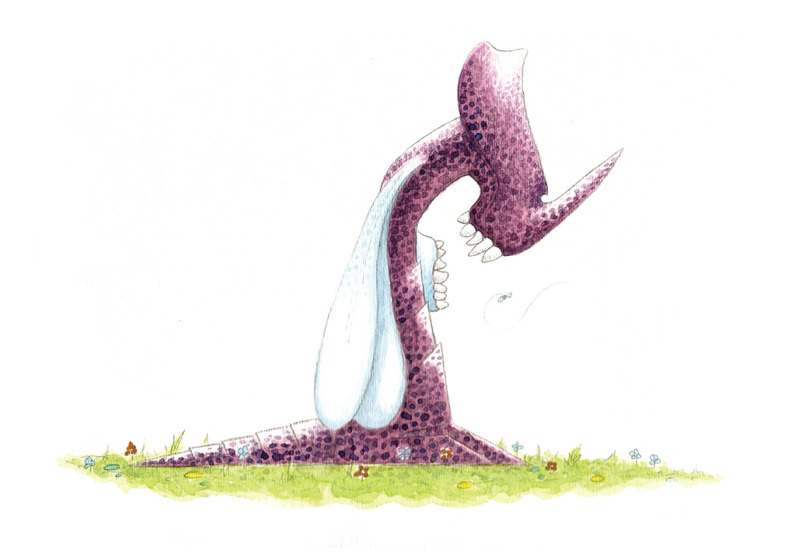 This character lives on the surface of Pollutopia as a statue-like figure. However it is actually quite mobile being a winged creature, it is simply waiting for its prey to come directly to it so it can slam down its disjointed jaws. This creature draws in prey with its harmless apperance and flase head while actually being a vicious predator. Pollutopia: Loosley based on the 'Trash Vortex' in the Pacific Ocean (a gathering of plastic from the world's oceanswhich is bigger than the State of Texas) Pollutopia is a long term art project crossing several mediums from painting/watercolor to sculpture and digital art. 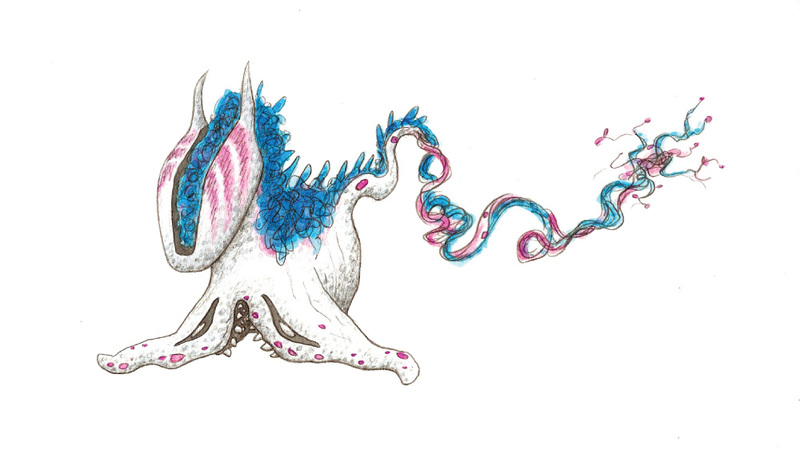 Essentially I have created a new world of little monsters and various sea creatures which reflect society and modern life. This creature is mostly made of shells which float individually around the mass of the creature. 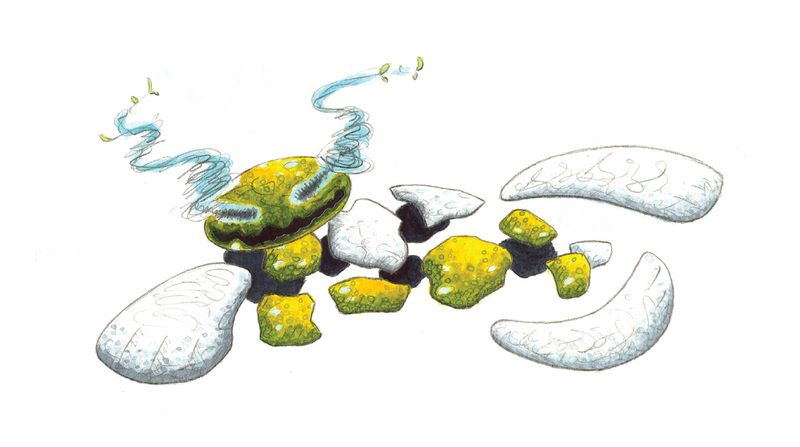 Whenever a smaller Pollutopian wanders within the shells the turtle contracts its body parts trapping the creature and eventually devouring it. 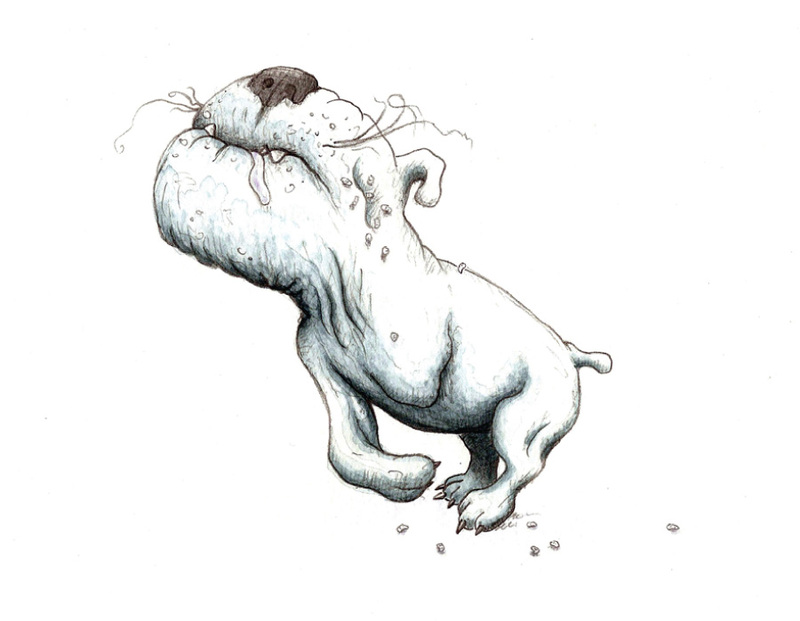 In this particular dream, I saw a creature which resembled a dog but completely twisted and deformed into something which seemed like it couldn't possibly survive. I noticed the dog had maggots in its eyes and only three legs. 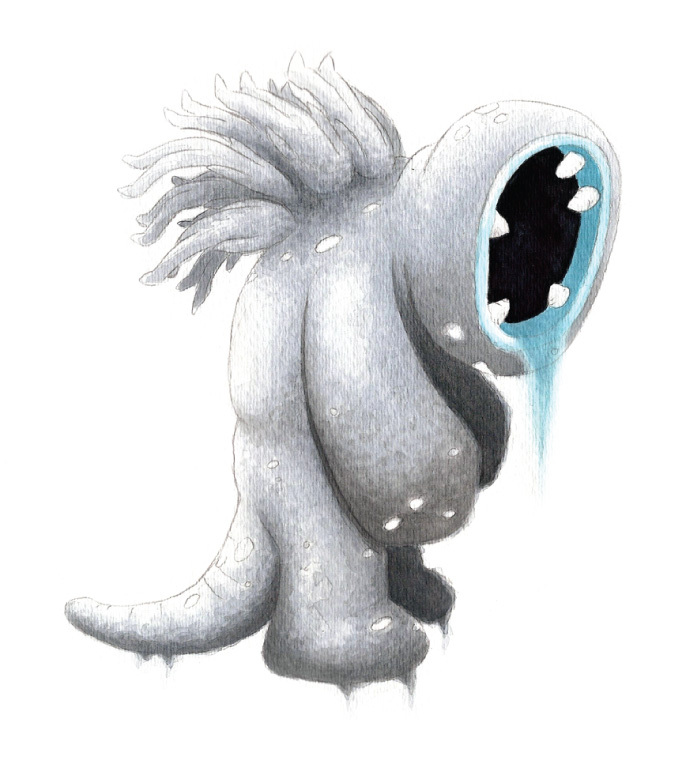 This creature came about in my anxiety series but migrated to Pollutopia to live amongst the Pollutopians as an outsider. 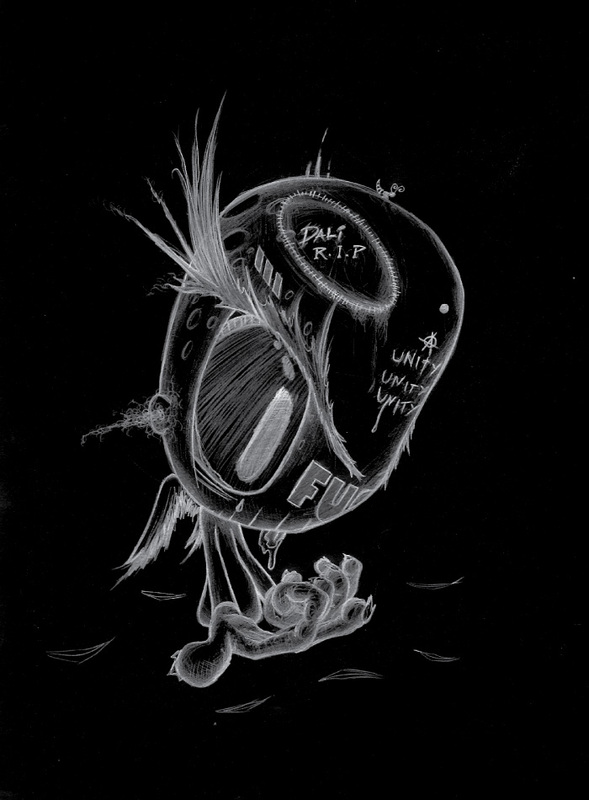 It represents the consuming aspect of depression and the hopelessness of despair in that instead of a face, it has the void mouth and several human figures have their heads in-prisioned in its back. 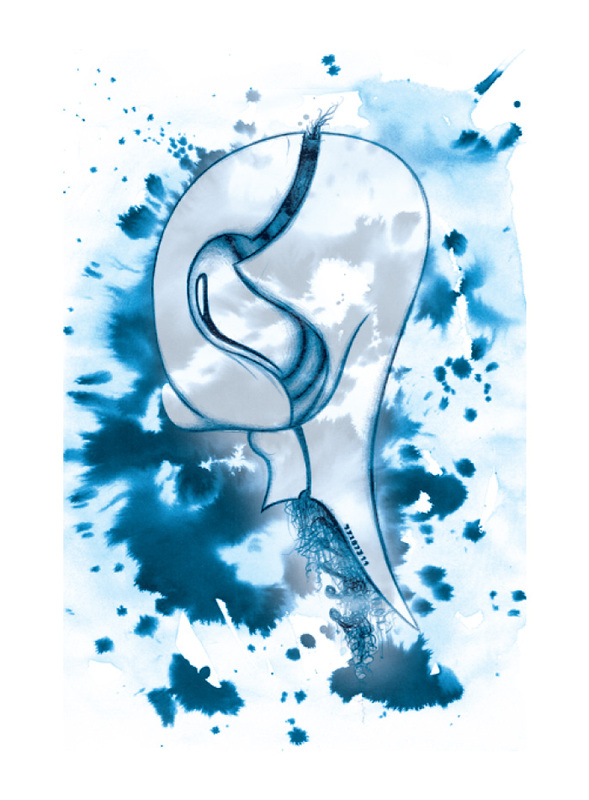 Anxiety/Pollutopia: Anxiety is a series of watercolors which represent some of my irrational fears and best describe my emotional state at times. In creating personifications of specific emotions like Anxiety and Despair, I am able to give a face to the things I struggle against. Over time as I have been practicing automatic drawing, the figure of Dionysus/Bacchus has been emerging. This is one of the first real manifestations of Dionysus drunk and blissfully dancing to the drumbeat of some tribal rythym. 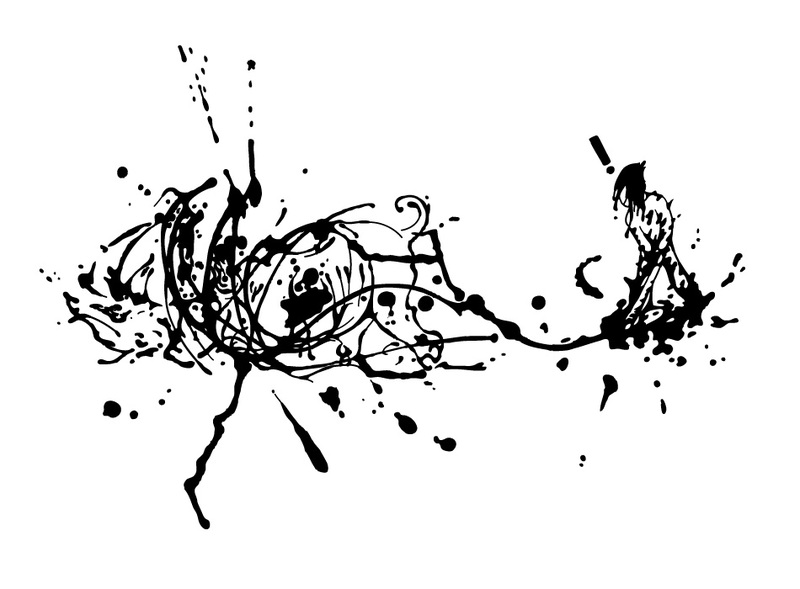 I wanted to make it seem as though he wasn't quite there by playing with the positive and negative space and also creating a kind of burning effect to represent ecstasy. One of my favourite comedians of all time. I had seen Louie around in some films but never knew who he was until recent years. 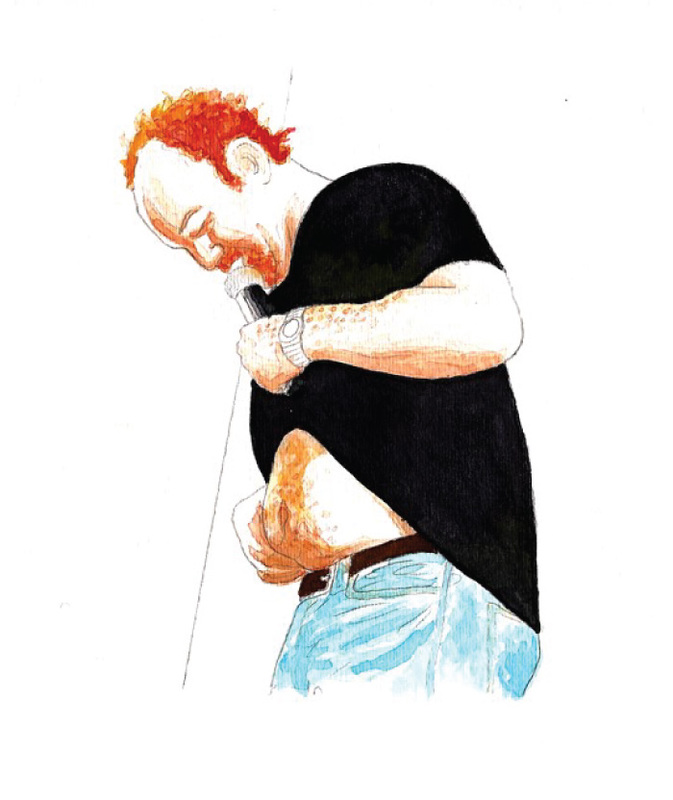 His brand of self-hating comedy exemplifies the idea of a 'sad clown' to me and I created this watercolor as the first of many Louie illustrations. Sad Clowns: A series of watercolor illustrations which depict various entertainers and artists from the public realm. I intended to illustrate just comedians I liked at first but I have added more and more people from various feilds who to me seem to resemble sad clowns in that their work is much more serious than at face value.